Colic simply means, "abdominal pain". When this occurs in cattle the resulting condition that causes the colic to occur is referred to as "bloat". The disorder happens when an accumulation of gas becomes trapped within the cow's ruminal forestomachs. Bloat in cattle can prove fatal quickly by compressing the cows respiratory tract and heart which will result in the animal's suffocation. Within the stomach of a cow there exists numerous bacteria, fungi, and protozoa which live in harmony and almost a symbiotic relationship with each other. These organisms work as a team to help digest the cow's diet. As the organisms break down the food they produce a very large quantity of gas. The gas forms a bubble that travels up to the rumen and is expelled as a belch. The cow belches once every minute, according to the Alberta Government. Each belch lasts up to 10 seconds to completely expel the gas bubble from the rumen. When a cow consumes a large quantity of legumes, a froth builds within the rumen which does not allow the air bubble to be expelled through belching. Legumes appear to produce a protein which causes the froth within the cow to occur. Alfalfa fed in large quantities can often produce excessive gas and froth within the rumen which often causes the gas to be unable to escape. Feedlot food contains small particles of grains which also cause slime. The slimy substance prevents gas from escaping through belching. The cow will suffer abdominal distention during bloat. It will also suffer colic which can be severe and cause the cow to kick at its abdomen in a vain attempt to relieve the pain and discomfort. The cow will have difficulty breathing and its heart rate will raise. Projectile vomiting and diarrhea may occur. It usually begins to salivate heavily. Death can occur 2 to 4 hours after bloat begins. The cow will need to be removed from all feed. An emergency rumenotomy may need to be performed. A rumenotomy is a surgical procedure where a veterinarian cuts into the cows rumen to help relieve the gas. The veterinarian may elect to simply puncture the rumen using a very sharp instrument known as a cannula . It will be placed through the abdominal wall and straight into the rumen to help expel the gas. If the froth within the rumen is extreme a tube may be left in the rumen for a few days. If the cow is only suffering from mild bloat symptoms a tube can often inserted through the cow's mouth and esophagus. Once in the rumen the air bubble is locate and will be quickly expelled through the tube. When the gas is expelled the cow will feel immediate relief from all colic symptoms. 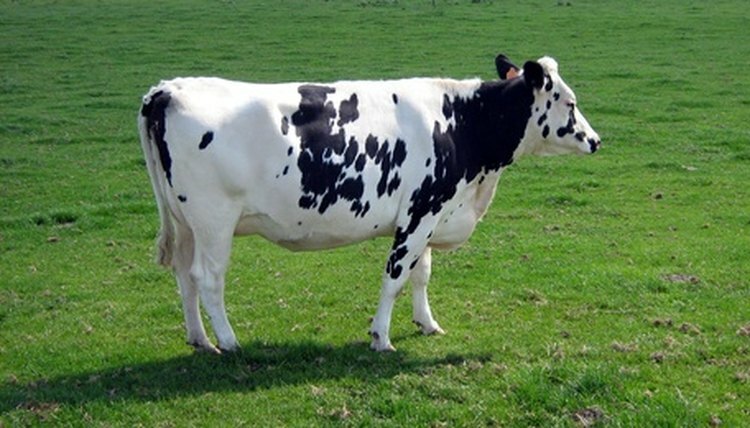 Many cows suffer from ongoing bloat. Unfortunately, a cow that has continuous bloat should be culled from the herd promptly.